by Brent Crampton ~ From acres of farmland to miles of skyscrapers - the majority of our readers lay somewhere in between. And with magazines such as XLR8R and URB talking about all the rage in London, Chicago, Miami or Germany – it makes a DJ wonder, “What if I moved to these places?” And what would happen if you moved? Would you make a name for yourself or would you just become another DJ standing in line, waiting for the next crap gig? The Transplant mini-series will explores those concerns by asking the people who have already done it. From rural areas to citified hysteria – this interview may answer your questions. This issue’s edition is a man who not only has jumped from city-to-city within the mainland, but has jump across continents to pursue his love of house music. With a nomadic appeal, Billa has lived in many cities, and has opened up for talent such as Derrick May, Derrick Carter, Fred Everything and Hipp-e, among many others. Currently holding down an underground house night in Santa Fe, New Mexico, Billa took the time to share his experience with traveling. You grew up in Philadelphia, you had a residency in Prague, now you live in New Mexico. What's going on with all the traveling? Growing up in the Philadelphia area was excellent place to learn about all kinds of music as a kid. Also having the option to hit up NYC easily has always made my passion for collecting vinyl a diggers dream. As for the traveling, it's been way fun. The Prague deal was such an amazing experience for me, and one I'll never forget. It came to me from good friends I knew for years, who just happened to move there with the idea to open a nightclub when the government changed in the mid 90's. It took off for them overnight. They always had me play parties for them back east, so they asked me too come and be a resident for them. I had 3 nights a week in 95' and got the chance to play with cats like Derrick May, Marcello, and Dmitri to name a few. The club was called Radost FX and is still going strong today on the circuit of many big DJ's. It was way too cool to pass up and a chance of a lifetime to rock records in one of the sexiest city's of the world! The reason for the move to New Mexico was originally a transitional point for a move to San Diego with two of my best friends from Albuquerque. The reason for the Southern California idea was because of a passionate house scene and clearly the ocean. Though some issues came up and I never left. I don't have any regrets at all cause the city has embraced me with so much love for my talents and really helped me develop so much of myself that has never seen the light of day. I have so much respect for everyone here (New Mexico) involved in our scene for this and I will always return the love to them I have received. Where were you living when you got the offer for Prague? What was the scene like? Did you have any hesitation before moving? If any, what was holding you back? I was living back East outside of Philly at the time. I was way hesitant about moving my life to a country I knew nothing about and had only visited for a week to see if I could make something there. The biggest drawbacks were definitely the language barriers, transportation and food. These are things I think we take advantage of a lot here. Also being able to basically feel some acceptance there. How has DJing over there and experiencing the culture affected you? Musically at the time I was really into breaks and I had things that no one ever heard there before, so the peeps just freaked. It was cool cause I was opening them up too a new world of sound. Living there was tough at times with so much changing so rapidly with the government. The younger generation was very excepting but the elders didn't wanna have anything to do with any westerners, especially when it came to getting your morning loaf of bread. I had to wake up way early to score something so simple as this. Tell me more about being a Westerner in Prague. Why was it difficult for you to get bread, and why did you have to get it in the morning? Do you have any personal stories of experiencing a prejudice projected onto you? Being a Westerner in that country at the time was easy to live money wise, but I was frowned upon by the older generations who lived there and were having a hard time with a rapidly changing country. I received the typical forms of prejudice such as, “You don't belong here,” and “You Americans are trying to change what we always have had.” As for me, I'm not really that political so I don't really involve myself very deeply in these issues. The younger generations seemed to love the Western influences because it opened doors to things they never heard or seen before when it was still part of the iron curtain. Although, I felt for the older generations on levels of money cause now it is harder for them to survive then when everyone was the same under Communism. Shopping was hard sometimes like with food for instance. Here in the states it's insane how much choice you have. And there, you might see something once at the grocery store, and never again. Like with the bread, which is my favorite food, it was just hard to score it cause it would be very limited and elders would always up you in line. It was cool, though. I just respected them cause I was new to their world. Did you live off of your residency, or did you have to take up another job? I couldn't have any other job other then DJ’ing cause I didn't have a work permit. So yeah, I just lived off my residency, which was enough to live at that time there. My rent was $80 a month. You can't beat that. Everything was so cheap during those first years when the government was changing. That’s why it became such a mecca for artists and young people to explore. Why did you move back? And where did you come back to? Well honestly, I got sick, and our medical system was way stronger at that time. As for my return, it was back east to the outskirts of Philly, which was home to me. What brought about the move to San Diego attracted you besides the ocean and great music scene? Did you have contacts out there? What held you back from getting out there? In retrospect, do you feel as though New Mexico was actually your intended destination? The reason I wanted to move to San Diego was mainly a passion for California. It was a place I visited many times before, and just felt at home. Yes the house scene has a lot of talent there and respect for what it's all about, which is choice for someone like me who loves it. It was also an idea my DJ friends from here had in mind - to try and take it higher in a bigger city. Yes, we had some good contacts there who offered to help, but we were just a team and we knew what we had to do. The reason for staying and watching my bros go is personal but I know the reason now, which I believe has been a huge development within myself and the life I'm gonna go after. New Mexico wasn't my true destination but it has been way good to me after I just let it be. Now, many dreams are just falling into place and honestly - you can't beat that! Any advice to impart to people about letting go and just traveling to where you are being pulled? Well this is what I was always told before: moving won't change you - you have to do it yourself. Though, I don't truly believe that now. Maybe it's really facing yourself and maybe the energy of a new place might give you that opportunity, too. When did you start DJing? With over ten years experience, what keeps you in the game? I came across the art of mixing back in 93' at my first ever warehouse party experience in San Francisco. It actually was a Wicked party, put on by DJ Garth and Jeno, which you couldn't ask for any better experience than this. I instantly was hooked and amazed with the music. It impressed me so much just how you could take people on a path through sound and dance for hours - if one was open to it. What keeps me still in the game? That’s easy - a true love for the music and the energy it brings. What have been your more memorable moments with DJ'ing? Well they’re all memorable to me when it comes down to it, but there’s three that standout. The first being my first night in Prague at the "House garden party.” They made the club into a tropical garden - which was way cool. I was so nervous and actually my back got stuck from bending over so much I couldn't stand up straight after I finished. Though it was way worth it for the love of the crowd. 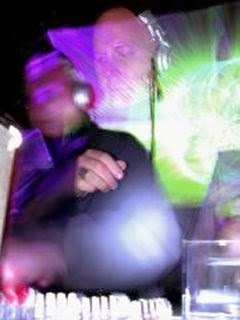 The second was being a replacement DJ for Mark Farina in Albuquerque of 2000 when he couldn't make it due to weather. Talk about being nervous - that was crazy! I was so scared of losing all these peeps who came from all over, but it just went off! People here still talk about the party today. My third wicked playing experience is none other then getting to set the stage for Derrick Carter last year! To me it's such an honor to open for the legend this man is - truly one of the best mixing nights of my life. What's the story with the Rhythmic Soul Lounge? Well this is the creation of my real good friend, Adam Gibbons, who is also a recent transplant from the East to the Southwest. It's based on a night he used to do back in Boston. He asked me to join as a weekly resident and collaborator of the night. We are only three months in and it has become one of Santa Fe's sickest underground hotspots, rumor has it. You can find Billa, right here.